It is important to have very clean and well-organized .fla files when you work in a team. At MediaMonks, we have naming guidelines which should be used by all monks. 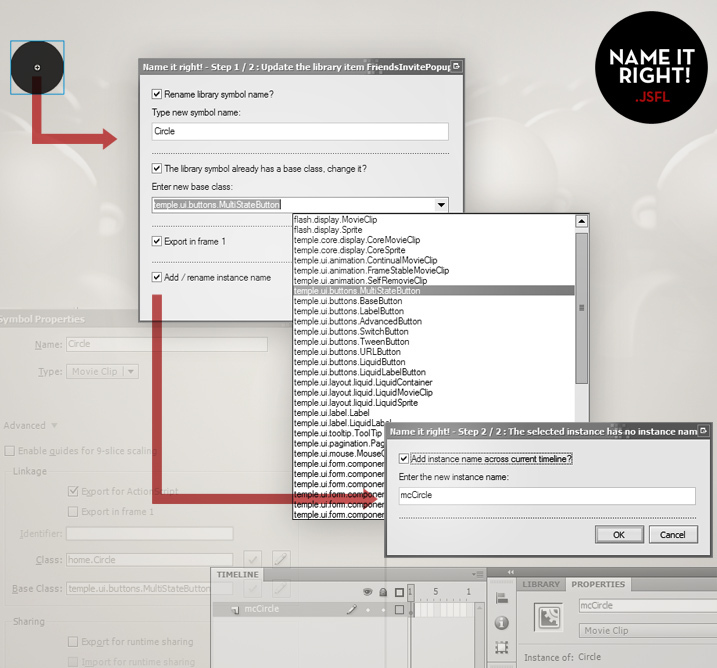 This tool is made to easily assign or change the class of a MovieClip, and uses our naming standards for the linkage names (which is filename dot SymbolName). It also gives you the option to change the instance name over the full timeline and fixes the layer name. The tool has a class-dropdown, pre-filled with Temple-classes, and the classes that are already linked to library symbols in your current document. I use this panel as complete replacement of the symbol properties window, since it is smarter and less annoying. Does this work in Flash CC? I’m sorry to say, but I have no idea if it works in CC, since I dont’t have (tested) it..
For the most part your JSFL Tools work fine in Flash CC. I did however need to fix some path issues. There is a slight variance in how fl.configURI returns across different versions of Flash… sometimes the returned string ends with / and sometimes (other Flash versions) it doesn’t. Flash Pro CC on Mac does return with the ending /, which breaks your paths for storing your temp XML files (your constructed path ends up like this: //Commands/). For a consistent and cross-platform solution, I always validate the URI from fl.configURI to make sure it DOES end with a / and then start appended paths without. Thanks Tom, will fix this in repo soon!